“Trade management for Ukraine” is a modern tool for increasing the business efficiency of a commercial enterprise. It provides an opportunity in the complex to automate the tasks of operational and management accounting, analysis and planning of trade operations. All this makes it possible to ensure high efficiency of staff and management of a modern trading enterprise. General characteristics "Trade Management for Ukraine 8"
In the applied solution “Trade management for Ukraine”, maximum attention is paid to ensure productivity. 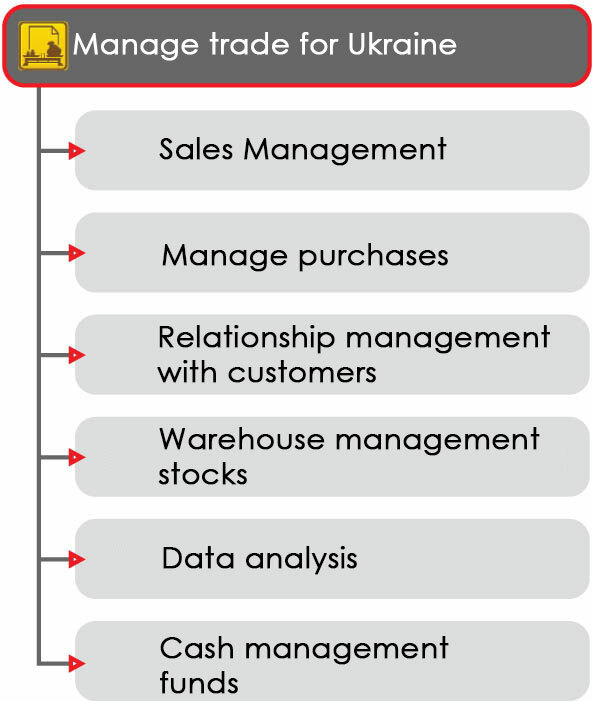 The wide possibilities for preparing all necessary documents, managing goods distribution and pricing, accepting orders and monitoring their execution, optimizing warehouse stocks, analyzing goods turnover, planning purchases and deliveries allow keep all records in one program. “Trade Management 8″ will allow creating a single information space in the company, organizing a clear interaction odrazdeleny help employees work as a team. It is important to pay attention to the fact that the developer of state of emergency is doing everything possible to make the use of their products more efficient and convenient. Therefore, all users of the “Trade Management for Ukraine” have the opportunity to order the information support service (ITS), which provides for the provision of integrated support and provides an opportunity to download updates and new releases. Analyzes the differences and identifies those responsible for each of the differences. Convenient forms of standard reports for control of account entries, such as a balance sheet, account card, etc. Responsible for tax accounting analyzes the deviation of the amounts of tax and accounting. Due to the fact that in standard reports (account analysis, turnover balance in an account, etc.) The amount for a specific accounting expense is immediately visible, the amount for the same expense can also be seen in tax accounting. Thus, controlling the differences becomes extremely simple. He has the opportunity to see a complete picture of the state of affairs at the enterprise in the report “Report to the Manager”, and he sees this information regardless of whether he is in the office or outside it. Receives information as an email.